Many thanks to my testers. 2. Change yarn color in the joining slipstitch. Pull the slipstitch tight. You want it to nearly disappear. 3. Don’t cut the yarn when changing colors just carry it up when needed again. When picking up the dropped color give it a tug to tighten up the stitch it was last used for. 5. If the last fptr is worked in the last st of a round, slip the first stitch of the round to join. If you don’t skip a stitch you will be making an increase on that round. 6. 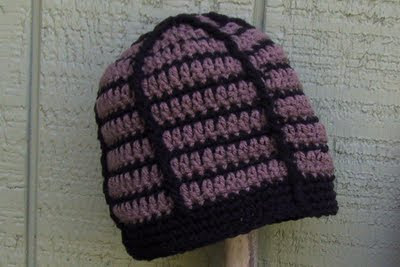 There won’t be the same number of single crochets between the fptc, but it won’t be noticeable on the finished beanie. 7. This pattern comes down over the ears, if you want a shorter version omit rounds 15 and 16. 8. Hat in photo is made with Red Heart Super Saver Cafe and Black. Cut main color yarn, leaving a tail for weaving in later. 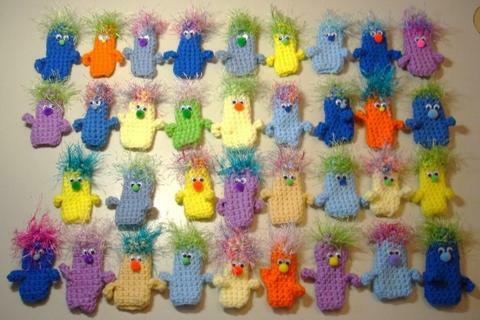 Finger puppets made by my friend JoAnne B of WA. Thanks for sharing your photo with us. After joining round 1, puppet is worked in continuous rounds. Use a stitch marker to mark beginning of each round. Or eyeball it, after all this isn’t rocket science. Turn your work after round 2; this is because generally eyelash yarn is fuzziest on the wrong side of crochet. If yours seems to be fuzzier on the front then you don’t need to turn. Use the tip of your yarn needle to fluff up the individual eyelashes that are caught in the stitches. For eyes use wiggle eyes or puff paint if for a very young child. Finishing: Slipstitch in next 2 sts, fasten off and weave in end. With toothpick place 2 dots of Tacky glue right below “hair” line, on adjoining sts. Place eyes on glue. Let dry and enjoy. 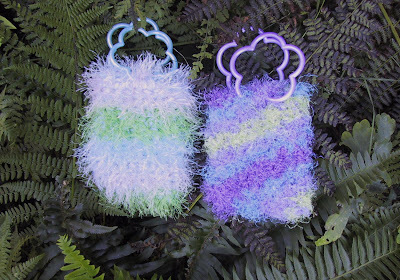 Since 1999 I have been making these little bassinet purses. 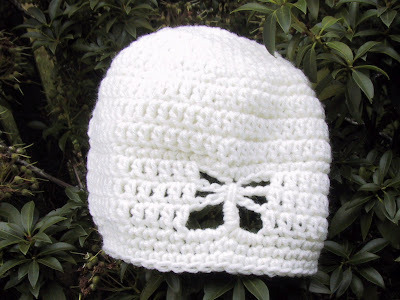 I started with this pattern and every year have tweaked it a little. This year I decided I would spend some time to get it just the way I like it. It is larger than the original. I leave the hood off, as it never turned out perfectly for me. I was always unhappy with the drawstrings, so I added a round just to corral those and like it much better. I thank Irene for the inspiration. Lots of little girls past and future thank her as well. 2/18/2010 Round 6 edited, Edit in red. 1. Read notes and instructions all the way through before beginning. 2. Round 1 has 7 dc (counting the ch 3 as a dc) on one end and the opposite end has 6 dc. That’s intentional, to make it work out to 45 sts. 4. Hdc shows three loops, the two you always see and a third on the back. You will be working first in the back loop and after turning working in the remaining two loops. 5. 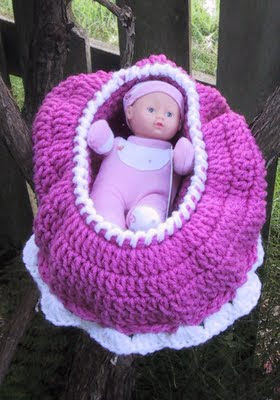 I used Red Heart Super Saver for the bassinet in the photo. 6. The doll was purchased at Wal-Mart. 7. Cut a piece of flannel 8 X 8 inches for blanket. Round 12: Sc in same st as join. *Ch 2, skip 2 sts, sc in next st. Repeat from * around. Ch 2 and join with slipstitch in top of first sc. EDGING: Attach contrasting yarn in any slipstitch of round 7. Rev sc in each slipstitch of round 7 (you will actually be working in the same sts the slipstitches were worked). Do not join, fasten off and use the yarn needle to join and weave in end. DRAWSTRINGS: (make 2) With main color, make a ch 36" long (approximately 120 ch). Fasten off. Starting at one end of bassinet, weave drawstring in and out of the ch 2 loops of round 12. Tie ends of chain together. Starting at the opposite end weave second drawstring in and out of the ch 2 loops of round 12 and tie ends of chain together at opposite end of bassinet. 3. All sizes are made with the same pattern. The different yarns and hook sizes make it the different sizes. Yarns I used in developing this pattern: Woman’s Red Heart Super Saver, Tween/Teen’s Simply Soft, and Child’s Red Heart Sport. 4. If you don't want to make a bullion for the body, you can use one of the methods I used on the Butterfly Garden caps. ROUND 6: Ch 1, sc in ea st, join with a slipstitch. SIZE: about 4 inches wide and 5.5 inches tall. 1. Read the instructions all the way through before beginning. 2. On these little bags I work from the inside. When on round 2 it cups up, I let it and just keep going around and around. 3. Bangle Bracelets are from Michaels 14 in a package, on their $1 aisle. 4. The easiest way to crochet over the bracelet is to hold it behind your work with the top of the bracelet even with the top of the bag. 5. I used Red Heart Super Saver and Patons Cha Cha or Lion Brand Fun Fur. The photo is with Cha Cha Vegas and RHSS Lavender. 6. 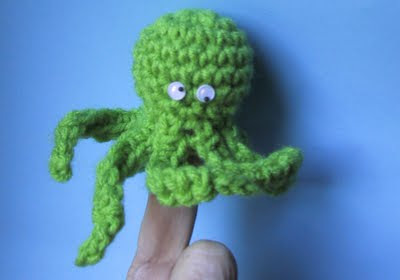 Novelty yarns seem to be fluffier on the wrong side of the piece. So use your judgment as to right and wrong side. In my case the wrong side becomes the right side. 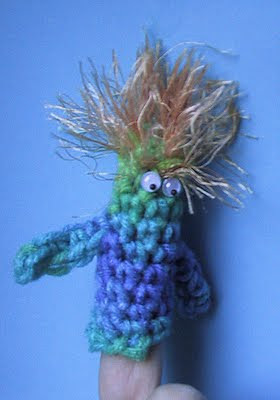 To fluff the novelty yarn I use a small hair brush and gently brush the right side of the item. 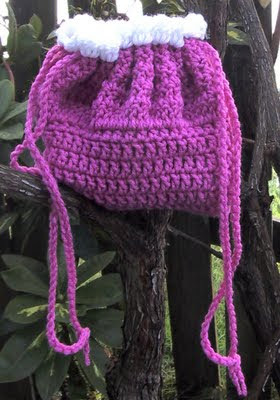 Bag is worked entirely with two strands, one of worsted weight and one of novelty yarn held as one. Round 1: 3 sc in 2nd ch from hook, sc in 6 chs, 3 sc in last ch, working along opposite side of starting ch and over beginning tail, sc in 6 sts. (18 sc). Do not join, work in continuous rounds use a marker to delineate beginning of rounds. Round 12: Sc in 6 sts. That should bring you around so that the next 3 sts are the center of one side of bag, if they aren’t work more or less sts. Working over the first bracelet, sc in next 3 sts. Sc in next 6 sts. Working over the second bracelet, sc in next 3 sts. Slipstitch in next st and fasten off. 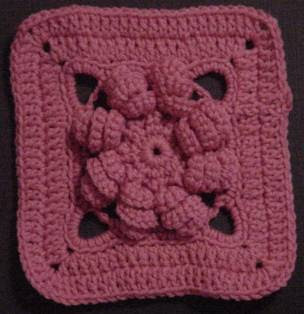 Bonnie Pierce graciously has hosted this pattern on her website since 2003. Thanks Bonnie. Chain 4, join with slipstitch to form ring. Round 2: Ch 12, 3 sc in 2nd stitch from hook, 3 sc in each chain (33 sc), Sc in next 2 stitches of round 1. Repeat around there should be 8 spirals. Round 3: Ch 6, slipstitch in first sc at tip (spiral should be twisted clockwise) of spiral, ch 6 slipstitch in 2 sc of round 2, repeat around, 16 chain 6 loops. This should be a 6 inch square for a 7 inch square work another round of dc with 2 dc, ch 2, 2 dc in corners slipstitch in top of ch 3 (96 dc) and fasten off.